The paper’s site was packed with coverage that was “Tireless. Dogged. Spirited.” And it was something else: Free. When editors at The Boston Globe recognized that their city had been bombed by suspected terrorists who were still at large, they immediately mustered a substantial and experienced newsgathering team to cover one of the most tragic, frightening and unsettling moments in the long history of a great American city. They got the story, from the epic photos of the heroism of emergency workers last Monday to the remarkable announcement on Friday night of the apprehension of the second suspect in the bombing attack. Bostonians read the Globe all last week with a passion, as they did the tenacious Boston Herald, its smaller rival in a rare competition for big-city readers. Along with the Globe’s Boston readers, millions of people across the United States and around the world made the paper’s website an Internet hot spot. That most of this reading occurred online is not news. What we call “newspapers” are better described today as “newsrooms.” It is silly to talk of an “old media” versus “new media” divide. A daily paper is still printed, and some of us love the experience of reading it. But, especially in rapidly-evolving “breaking news” moments, it’s the website that’s got the dynamism. And Twitter: the Globe now has 275,000 followers. And the Globe’s coverage was something else: Free. The readers came. On the day the paywall came down, the paper attracted 1.2 million unique visitors—six times the normal amount. Of course, dramatic events drew readers; of course, many of the new readers were from outside the Boston area. But the numbers were way, way higher—locally, nationally and even internationally—because readers did not have to jump through digital hoops and type in credit card numbers. So dropping the paywall made sense from a standpoint of civic responsibility and from the classic journalistic standpoint of wanting to get new information and ideas to the broadest possible audience. But it was not viewed as as economic success for the Globe, which is currently up for sale and wrestling with all the financial challenges that face American newsrooms. On Monday, the paywall will return. That’s understandable but, to my view, unfortunate. It is no secret that this is an era when major media outlets are desperate to find ways to pay for journalism. In some cases, this really is because they are out of touch with their audience and because alternative media is simply more compelling. But, more often than not, this is because of a dramatic shift in media economics. Advertising revenues that once sustained vast newsgathering operations, with deep commitments to cover communities, states, the nation and the world, have collapsed. And online advertising does not begin to provide sufficient support to pay for the journalism even of popular news sites. Many publications (including The Nation), and most major dailes, have experimented with strategies to get people to pay for news stories, columns and editorials. 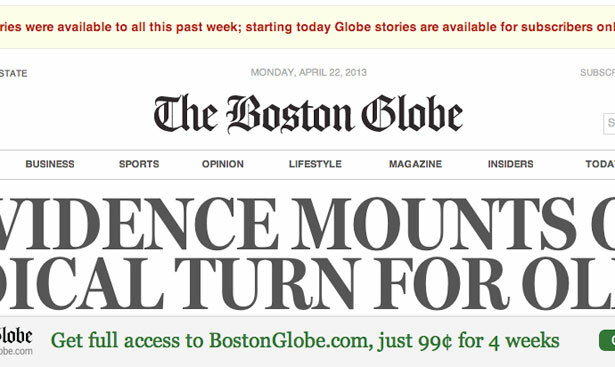 the Globe erected a subscription-style paywall two years ago to try to collect revenue from readers. It has had some success with this approach, as have other publications that are experimenting with models that charge for individual articles or groups of articles. The decision by the editors to collapse the paywall at a critical juncture for the city the paper has covered since 1872 was not unprecedented. A number of major papers did so when Superstorm Sandy was hitting, as did several during in the aftermath of the Boston bombing. But the Globe’s move was especially wise, and valuable. And it ought to provoke a new discussion about whether paywalls make sense, economically or journalistically. I agree. If Boston pays the Globe back with a flood of new subscriptions, I’ll be thrilled. But we ought not presume that this will be the case. Americans who recognize the importance of not just journalism but the daily amalgamation of journalism that is produced by classic urban newsrooms—with substantial numbers of at least reasonably compensated reporters, columnists, editors, photographers, graphic specialists and all the other people who once made newspapers work and who now make news-oriented websites work—should be thinking of how to get the most news to the most people. The huge readership—and the huge regard—that the Globe achieved during a critical week in the history of its hometown reminds us that there are a lot of readers out there who don’t leap paywalls. That’s unhealthy for the future of big urban newsrooms, for the future of journalism and for the future of a vibrant and nuanced democratic discourse. A lot of traditionalists would like to imagine that the people will eventually pay. After all, they say, newspapers have always charged for subscriptions—or copies on the newsstand. So it is that newspapers keep closing, cutting back and laying off reporters, photographers and editors. But it’s not just the economic challenge that worries me. When a paywall limits access to the journalism produced by a great city’s newsroom, the public debate suffers. People can still get information, but they are edged out of the core conversations of their community—and often toward sources that reinforce rather than challenge and expand assumptions. My point here is not to suggest that metropolitan dailies—or, to be more precise, the newsrooms that now produce the most popular news sites—can or will simply provide great reporting and analysis at no cost. What I am suggesting is that publications should be examining alternatives to paywalls. If we learn anything from the Globe’s experience of recent days, it is that it’s a good idea to make information and ideas available to all readers in a moment of crisis. But why isn’t it a good idea to make information and ideas available during elections? During great debate about national, state or local priorities? Or during periods when cities are “getting back to normal” after terrifying events? In other countries, journalism is sustained with public subsidies and tax breaks—not just for muscular public broadcasting systems but for print and digital journalism. There are, as well, models for running newsrooms (like that of The Tampa Bay Times) as nonprofit or low-profit enterprises, and for leveraging foundation money and community investment to sustain journalism. Some communities—including St. Louis and Seattle—have seen the use of public radio stations as platforms for sites bring together laid-off newspaper reporters to cover local news. People who care about journalism can and should be engaged in a wide-ranging discussion about how to sustain journalism in the twenty-first century. And this week’s decision by the Globe to drop its paywall should get not just reporters, editors and publishers thinking about those alternatives. It should get citizens engaged with the issue. For Boston in particular, but for the nation in general, this past week has been daunting. People haven’t just wrestled with the news, they have wrestled with questions about the news means. It is natural in such a circumstance to try to figure things out, to struggle with questions about specific events and about broad threats and deep fears. About clues and indicators. About responsibility and accountability. About the balance between public safety and civil liberties. This wrestling with issues and ideas, this search for explanations, can be frustrating and contentious. But it’s healthy. It means that people are engaged. Even when they make mistakes, they tend to do so sincerely. What’s important is that citizens have a steady flow of information and analysis and—of particular significance in so intense a circumstance—thoughtful reflection that helps steer the discussion beyond kneejerk reactions. How not to normalize terrorism in the wake of what happened in Boston? Read Aura Bogado’s interview with Sohail Daulatzai.